There are three main types of rollators: three-wheel, four-wheel and heavy duty. Thee-wheel—three-wheel rollators have a wheel in the front and two in the back. They are easy to maneuver and can make tight turns. They do not have a seat but tend to be lighter and more portable than a four-wheel rollator. Four-wheel—four-wheel rollators have two wheels in the front that swivel and two in the back. Most come with a seat so the user can rest. They provide more support than three-wheel rollators. Heavy duty—Heavy duty rollators have a higher weight capacity than standard rollators. These four-wheel rollators usually feature reinforced steel frames and wider seats. The wheels tend to be larger and wider as well. Frame—Lightweight frames are usually made from aluminum. Steel frames are stronger and recommended for users over 250 lb. Wheels—The larger the wheels, the easier the rollator is to push. Larger wheels also make it easier to go over rough or uneven terrain, making them better for outdoor use. Wheels with a diameter greater than 8″ are considered large. Small solid wheels are recommended for indoor use—these tend to maneuver around tight spaces better. Brakes—There are several different types of brake systems for rollators. The most common are push-down and cable loop. Push-down brakes require the user to provide downward pressure on the spring loaded frame to stop rolling. The brakes are easy to engage since all the user has to do is lean on the rollator. The brakes are released when the pressure is lifted. They may not be suited for petite users who don’t have the weight to engage the brakes or heavier users who inadvertently engage the brakes. The cable loop brake system is the most common. It works much like brakes on a bike. They are engaged by squeezing the handles and levers simultaneously with both hands. Every rollator with a seat should have brakes that lock. The brakes should lock so the rollator doesn’t roll away when the user is sitting on the seat. Baskets—Most rollators come with baskets or pouches to carry personal items or groceries. Check the brake system and wheels regularly for wear and damage. If damage is found or parts need to be replaced, contact the manufacturer’s local authorized dealer for service. Always consult the owner’s manual for recommended maintenance and cleaning instructions. Cleaning—Clean the frame with soap and water weekly and be sure to wipe the rollator dry whenever it gets wet. How much does a rollator cost? Prices for four-wheel rollators start from about $60. 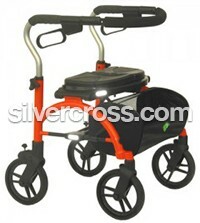 Though the three-wheel rollator has one fewer wheel, it doesn’t mean it costs less than a four-wheel rollator. The price for three-wheel rollators starts at around $80. Heavy duty rollators start around $200 and go up from there.